Spotify have a user base of about 40 million active users. 30 million are non-paying users and the remaining 10 million are Spotify premium users. Currently advertisers can choose from the following ad specs: Audio Ads, Display Ads, Billboard Ads, Homepage Takeovers, Branded Playlists, Lightbox and Advertiser Pages. Users spend an average of 146 minutes listening on Spotify everyday. In the last year, Spotify mobile users have tripled. How will Spotify video ads work? There will be two video ad units available to advertisers. This feature allows users to watch a video advertisement in exchange for 30 minutes of uninterrupted ‘ad-free’ music. This is similar to the current Spotify advertisements in that it will interrupt the listening experience and play the video ad as opposed to the existing audio offering. 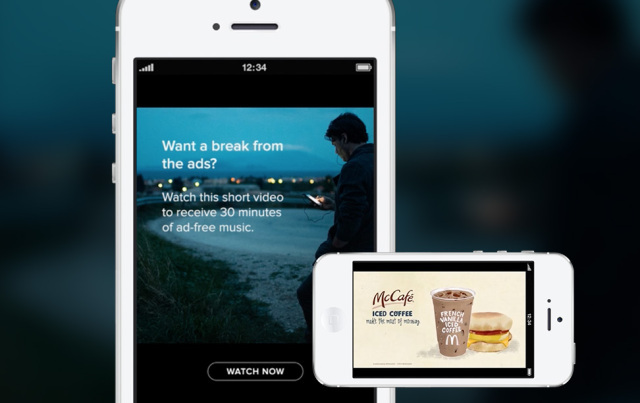 Similar to Instagram, Spotify have selected a small number of brands to test the video ads. They include Coca-Cola, Ford, McDonalds, NBC Universal Pictures, Target and Wells Fargo. Most of these brands are already advertising with Spotify. The new video ads will only be available in the following markets in Q4 on this year: United States, United Kingdom, Germany, France, Spain and Sweden. They will be available globally in 2015.